When I began sewing in 2000, I started by making costumes and shirts. I've made about 50 shirts over the years. Some have been made for others, but most have been casual shirts I've made for myself. Recently, I've taken a more creative approach to the shirt design - combining different fabrics and techniques to create unique pieces. This early project began with some home dec fabric that I made into a shirt. The colors reminded me of moss-covered rocks. Phil is a huge Harry Potter fanatic. 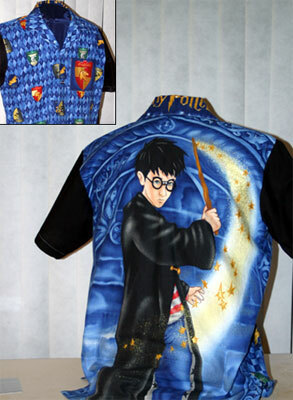 This shirt was constructed from a Harry Potter fabric panel and a couple of coordinating fabrics. The fabric panel was designed to be used as a quilt, so the fun of this project was cutting up and re-arranging the pieces to fit on a shirt - the big panel on the back arranged so the arch went from shoulder to shoulder, the house emblems on the front, the rope design along the front facings, the "Harry Potter" text logo wrapping around the collar, and the large Gryffindor crest (cut from a pillow panel) cut to make the pocket. Phil usually wears this shirt when we go to the Harry Potter movies. I love Asian-style fabrics and this shirt began with a terrific Alexander Henry print called "Beautiful Shozo" combined with a nice mottled burgundy fabric. 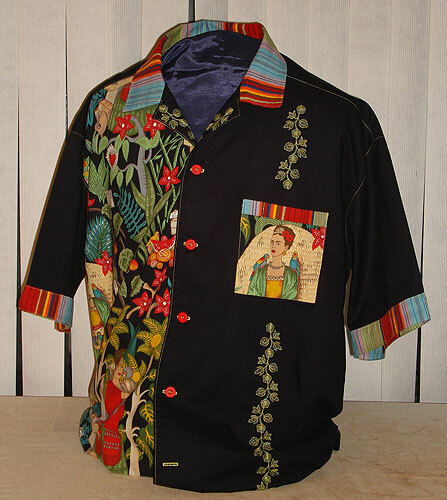 This shirt used a beautiful piece of fabric from the "Gingko Fantasy" line designed by Lonni Rossi. It's a mottled black background with lovely red blocks with gold gingko leaves. I saw this fabric at a quilt show and my mind immediately started picturing how to lay out the shirt. The fabric has small motifs running along the left and right sides, with larger motifs running along the center. By laying the pattern pieces carefully, I was able to make the designs flow around the shirt in interesting ways - large motifs running down the center back, small motifs on the front panels, and wrapping around the sleeves and collar. When completed, the shirt came out exactly as I had imagined it. 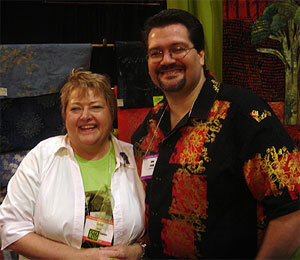 I attended the 2005 International Quilt Festival in Houston and stopped by Lonni Rossi's booth. She was so sweet and complimentary and even posed for a photo with me. Gingko Fantasia won first place at the 2005 State Fair of Oklahoma. 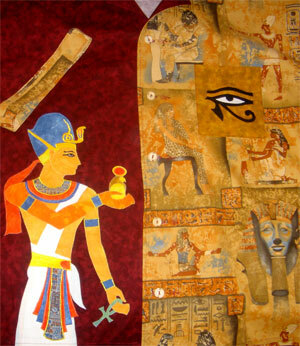 This shirt was started shortly after I completed the Pharaoh quilt for the MEN OF BIBLICAL PROPORTIONS quilt exhibition. Using the designs I created for the quilt, I built another Pharaoh appliqué using my hand-dyed fabrics on a mottled burgundy base fabric. 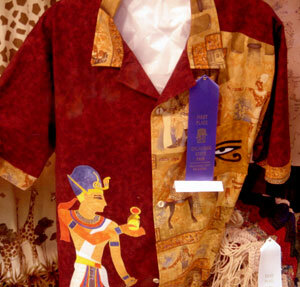 The left side of the shirt features an Eye of Horus appliqué on the pocket and is built on a commercial fabric called "Pharaoh" from Alexander Henry. Other details include burgundy sleeves with contrasting sleeve bands and decorative stitching. I knew I was going to Houston to see the premiere of the MEN OF BIBLICAL PROPORTIONS exhibit, so I created this shirt so I could wear it and folks would know which piece was mine! This shirt won first place at the 2006 State Fair of Oklahoma. This shirt was inspired by the bright colors and folk art graphics found in the many paintings and self-portraits of Mexican artist Frida Kahlo. As soon as I saw the gorgeous fabric prints from Alexander Henry, I knew they would have to be featured in a shirt. My Pfaff creative vision embroidery machine had a large decorative stitch that coordinated perfectly with the flowers on the fabric. The embroidery was sewn using Sulky Blendables 30-weight cotton thread. 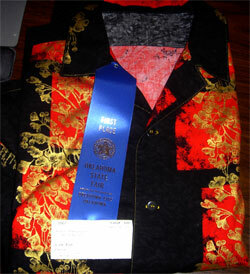 This shirt won first place at the 2008 State Fair of Oklahoma and second place at the 2009 OKC Winter Quilt & Embroidery Show.